The Tokina Opera 50mm F1.4 FF is a new lens for Canon and Nikon full-frame DSLRs. In addition to the Tokina AT-X series, which has been highly evaluated in the past, Tokina will expand the Opera series as a top model group for full frame in the future. 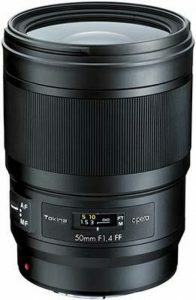 The 50mm F1.4 FF is the debut premium lens in Tokina’s new opera series for high-performance full-frame DSLR cameras. The lens incorporates Tokina’s latest advancements in optical engineering and electronic design to meet the demands of today’s DSLR technology. With advanced features like ring-shaped ultrasonic motors for fast and quiet operation, Tokina’s new ELR lens coating technology, and advanced weather sealing technology, the new 50mm F1.4 FF opera lens will be a go-to lens in many camera bags. With the debut of 50mm F1.4 FF Tokina is launching a new series of next generation, premium full-frame lenses for high-end DSLR cameras called “opera” series. The new series is designed to perfectly match recent high-resolution full-frame DSLR cameras that demand the highest quality optical designs. Building on the award winning heritage of Tokina’s AT-X line of lenses, the new opera series will offer an ever-expanding, premium line of Full-frame lenses that meet the growing demands of high-performance DSLR cameras. The opera 50mm F1.4 FF optical construction includes 3 lens elements molded from SD (Super-low Dispersion) glass and one aspherical glass element in the rear-focus lens group which effectively suppresses chromatic aberrations and deliver sharp edge-to-edge images at all apertures. The lens incorporates a 9-blade, round-shaped diaphragm for naturally beautiful bokeh. Tokina also incorporates an electric diaphragm specific to the Nikon mount for more accurate and precise aperture control. Fast and quite AF along with superior optical performance at all apertures and focus points makes this lens suitable for a variety of photographic genres and scenes. The Tokina ELR (Extremely Low Reflection) newly developed coating was engineered to specifically target the visible light spectrum as it enters and passes through the lens. This drastically reduces the reflection ratio when compared to traditional Tokina lens coatings. This results in dramatically reduced ghosting and flare when shooting in challenging lighting conditions especially when strong light sources are within the image. The lens employs the latest advancements in dust-resistance and weather sealing targeting 8 areas in the lens construction most vulnerable to dust and water penetration. When coupled with a dust and weather sealed DSLR camera, the lens will not let you down even in many adverse weather conditions. Focus ring rotation matches the proprietary direction of Nikon and Canon lenses. The BH-726 lens hood included with the opera 50mm F1.4 FF has a special filter window incorporated into the design. When the BH-726c window is removed from the hood the user has access to the filter allowing them to rotate polarizer or other rotation type filter.